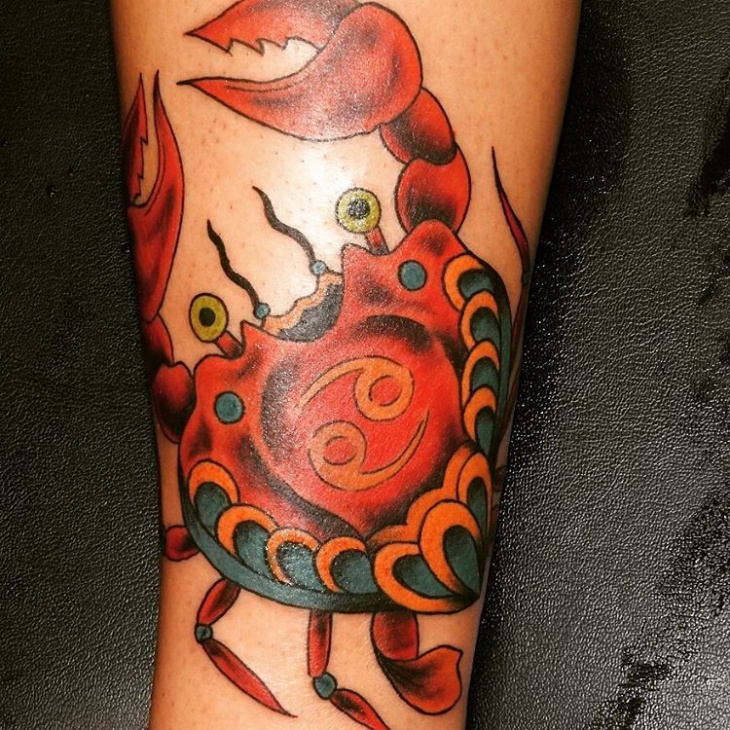 Among the most creative and stylish tattooing ideas that you can use to get inked is to go for the crab tattoo. 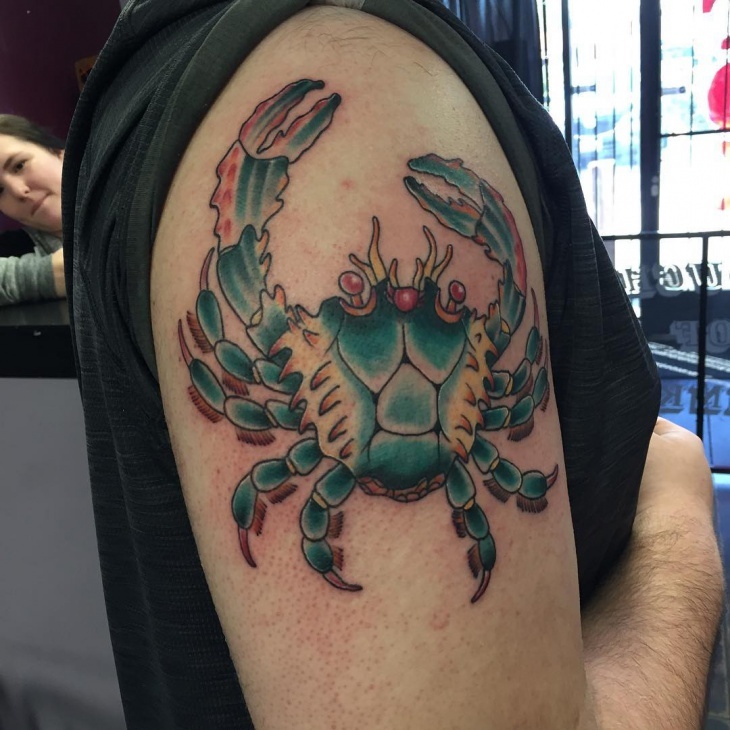 There are many ideas, thoughts and beliefs associated with the tattoo the main one being to indicate the zodiac sign cancer. Crabs link well with oceans and also the livelihood provided that most people living on the seashore have. 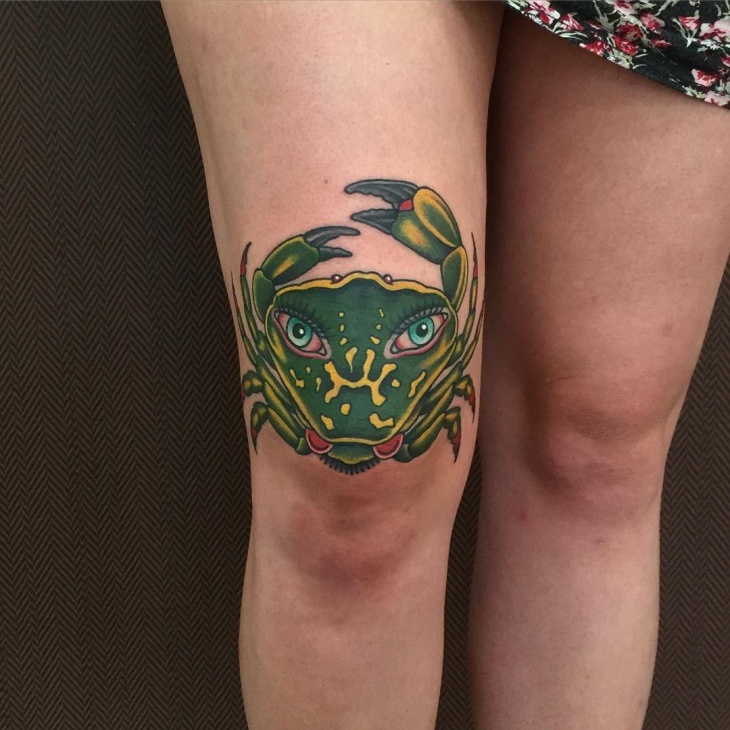 Talking about animal symbolism, crab mainly represents reprise and rebirth. 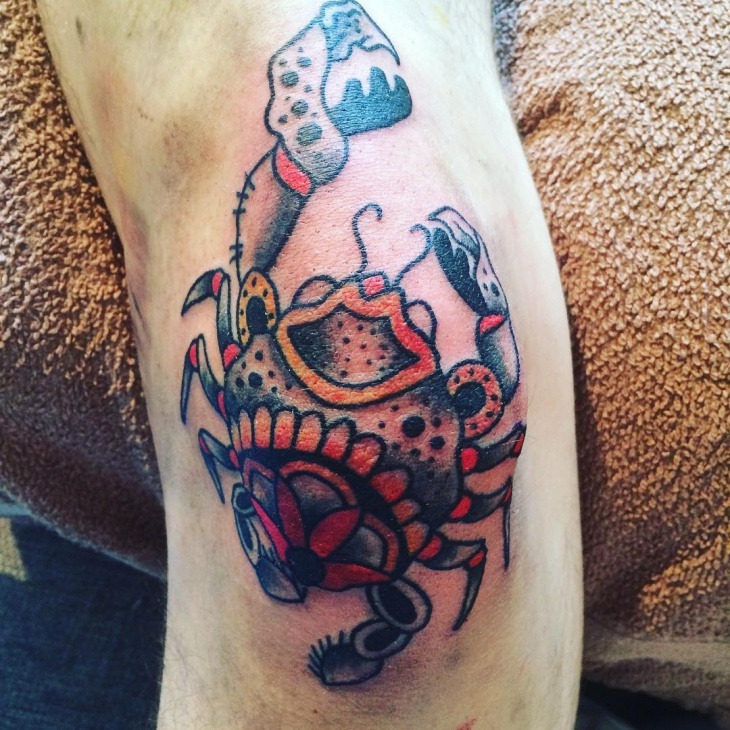 Crab tattoo can be a perfect idea for tattoo lovers who are considering their next design for ink. This would be a simple yet stylish tattoo for those who want a quick spill of ink on their hand. 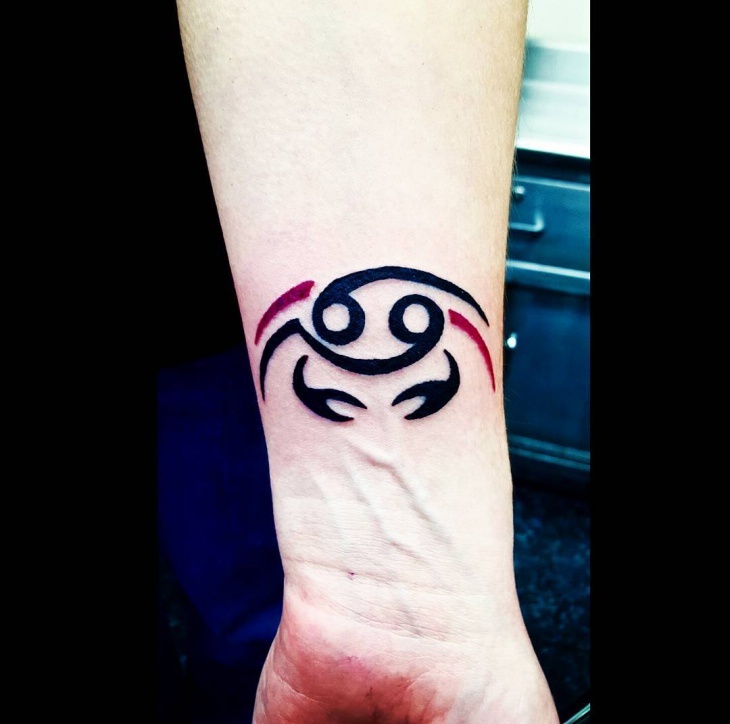 Additionally, you can also use other designs with this tattoo to make it look more interesting and trendy. 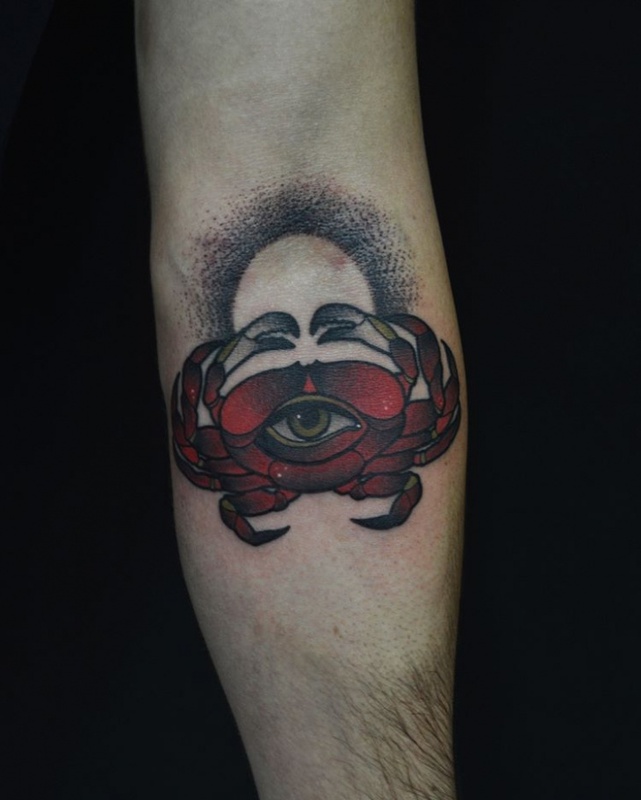 The crab tattoo makes a fine addition to portray sea life or zodiac sign without getting too flashy on your arm. 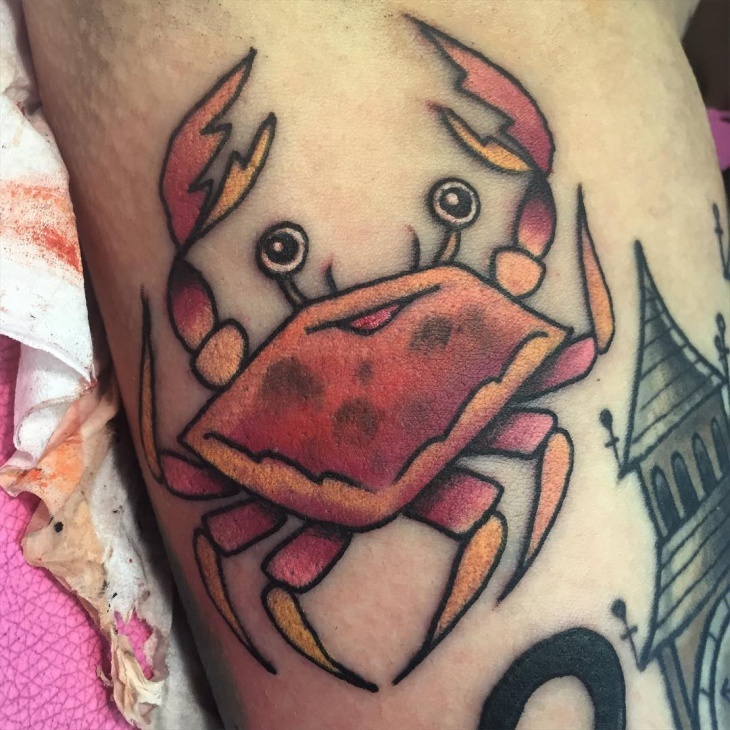 Crab inside crab is a creative inking idea that can be used in a number of ways and can be printed anywhere you’d like too. 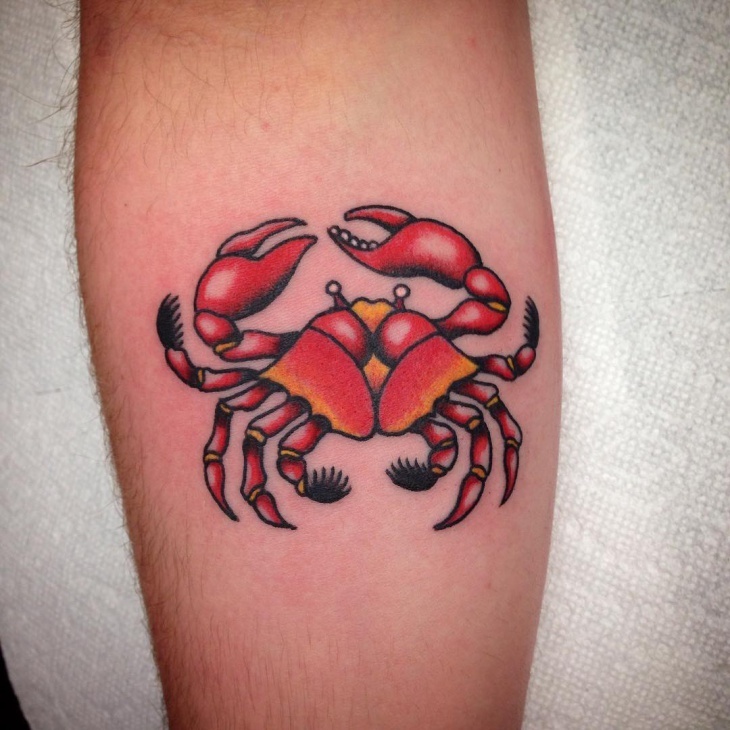 The tattoo simply resembles more power and wit with two crabs elegantly designed without acquiring much space. You can also use other creatures like scorpion, Mantis, ants, etc. 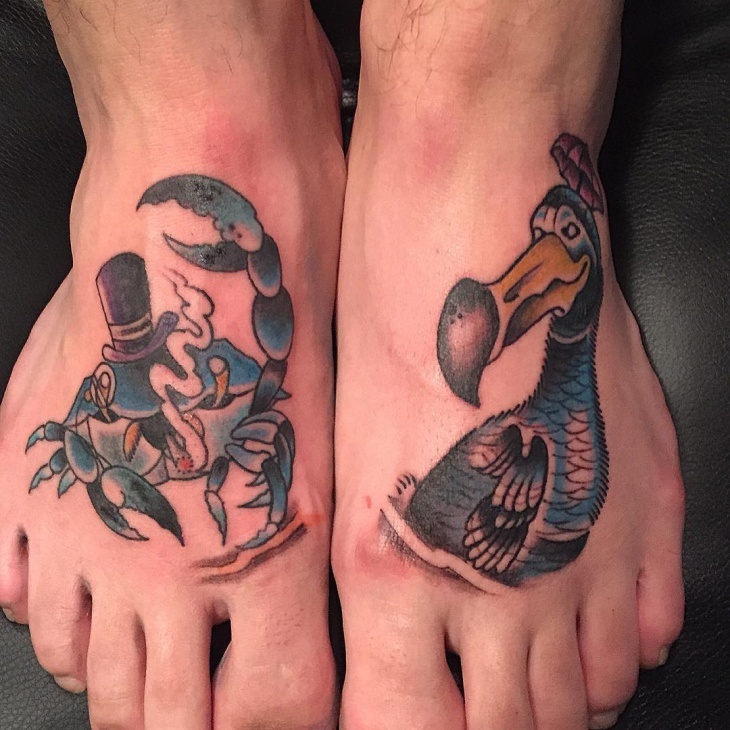 As you’ve got the key idea behind the tattoo, you’re about to just get inked in the most distinctive manner. 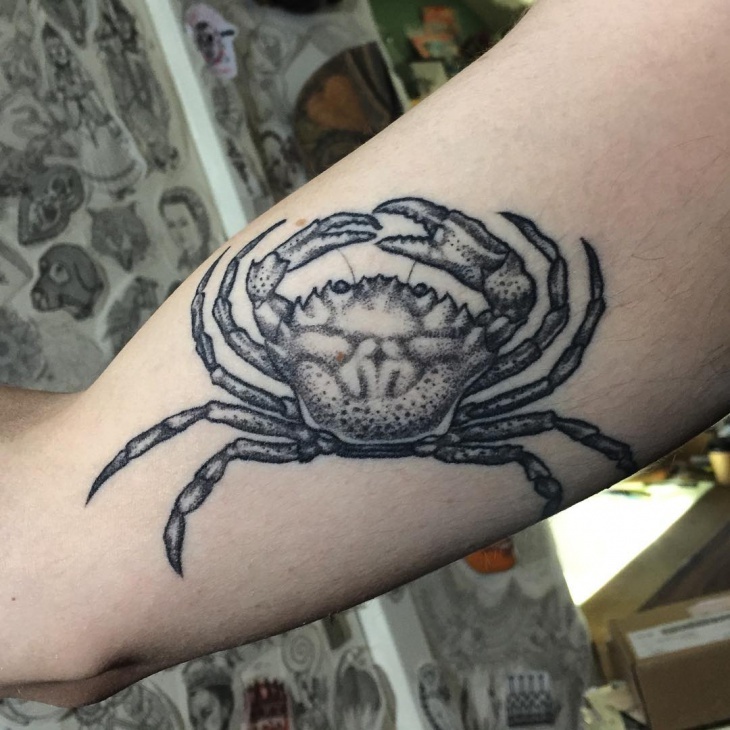 The tattoo distinguishes you from other crab tattoos with some unique ideas that shout out creativity from every dimension. You’ll enjoy all the expressive ideas behind this rich creation. 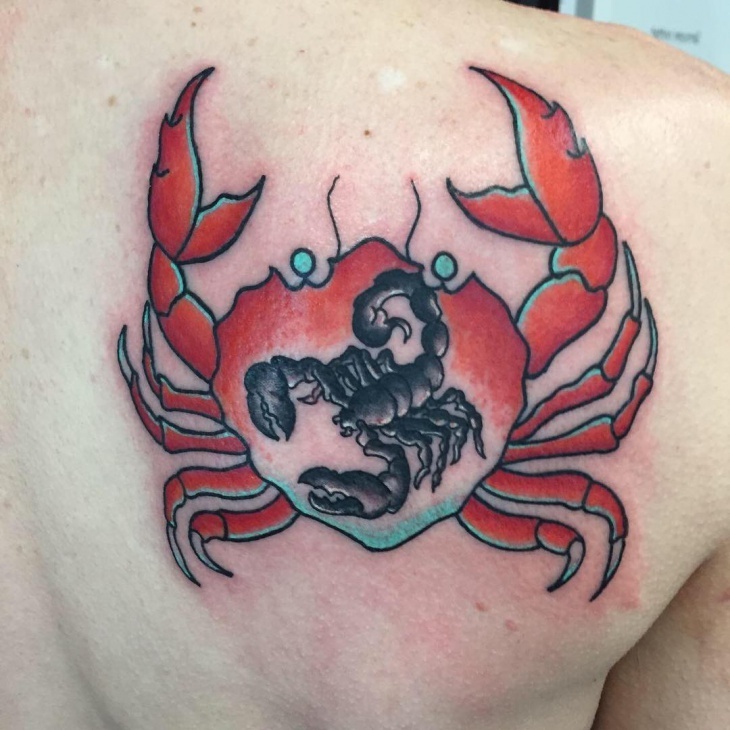 Being a common form of tattoo design, the traditional crab shoulder tattoo is appraised by many inkmasters as well as the tattoo lovers due to its sense of style and minimalism. 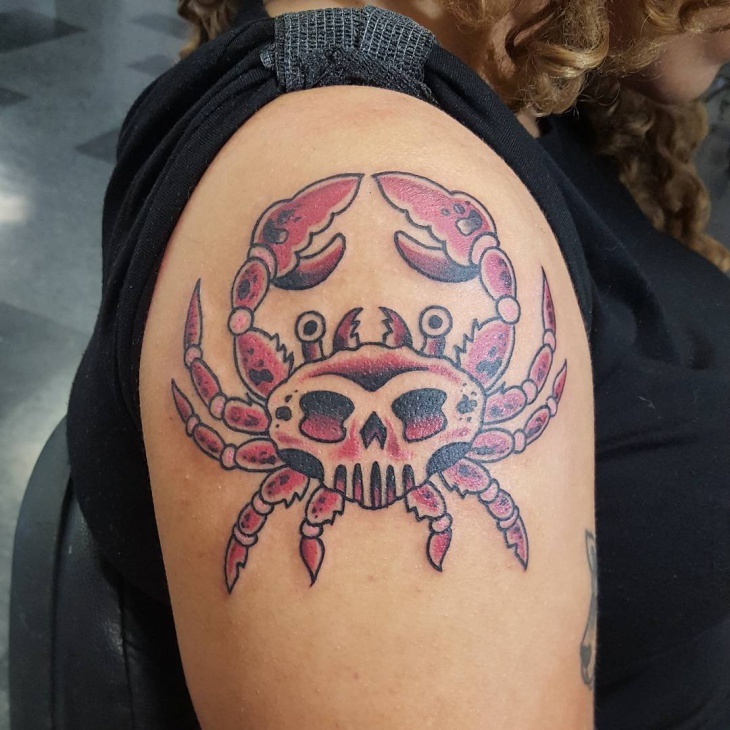 Designed in the right way to correctly occupy your shoulder, the black crab tattoo pulls a huge attention from the crowd and creates a style statement wherever you go. 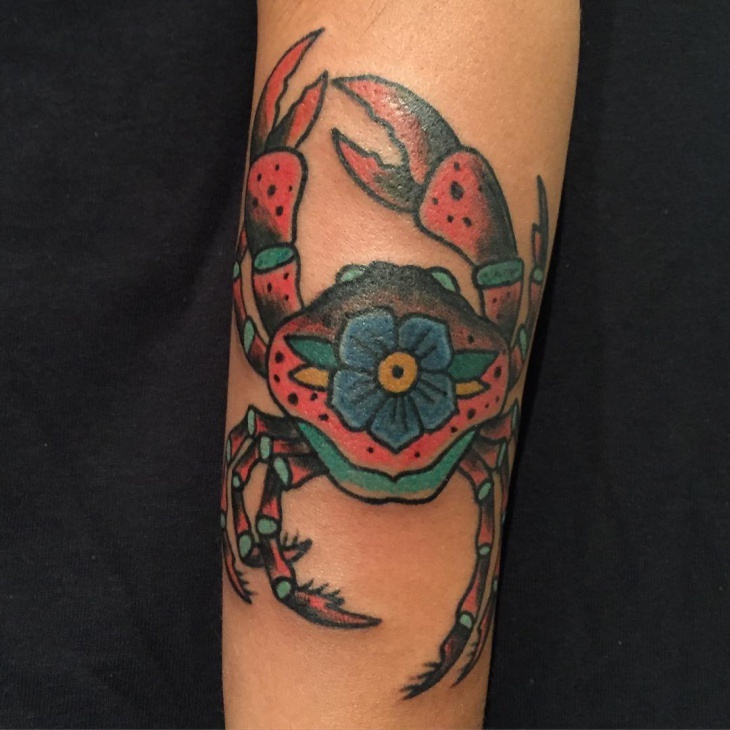 This crab is a favorite among zodiac signs lovers with rich colors and attractive tattoo designs. 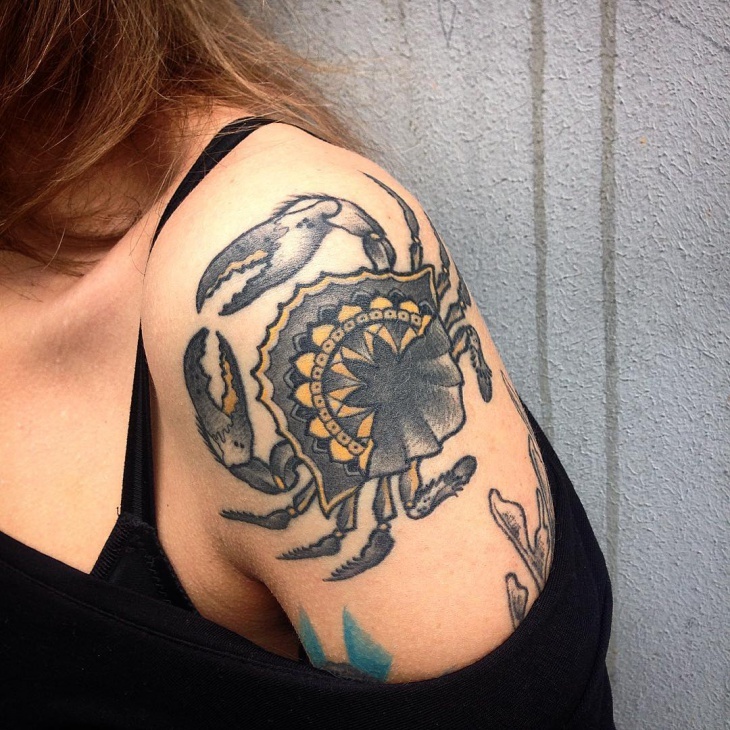 Being the fourth Zodiac sign and anyone who’s drawn towards the crab would obviously like to resemble features similar to the crab like a tough exterior for protection of susceptible interior, perhaps also suggesting a few hidden weaknesses. 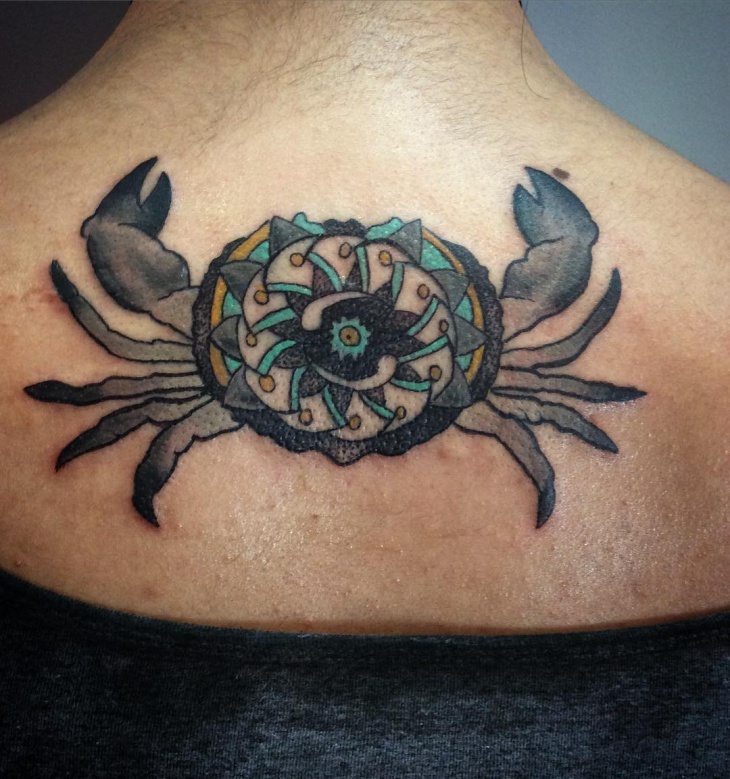 With huge varieties of crab species, you can select the type of crab you wish to see on your back neck with Crab Mandala Tattoo. In different Indian religions Mandala is a ritual symbol. Symbolically or metaphysically, the Mandala signifies cosmos which is a miniature form of universe. 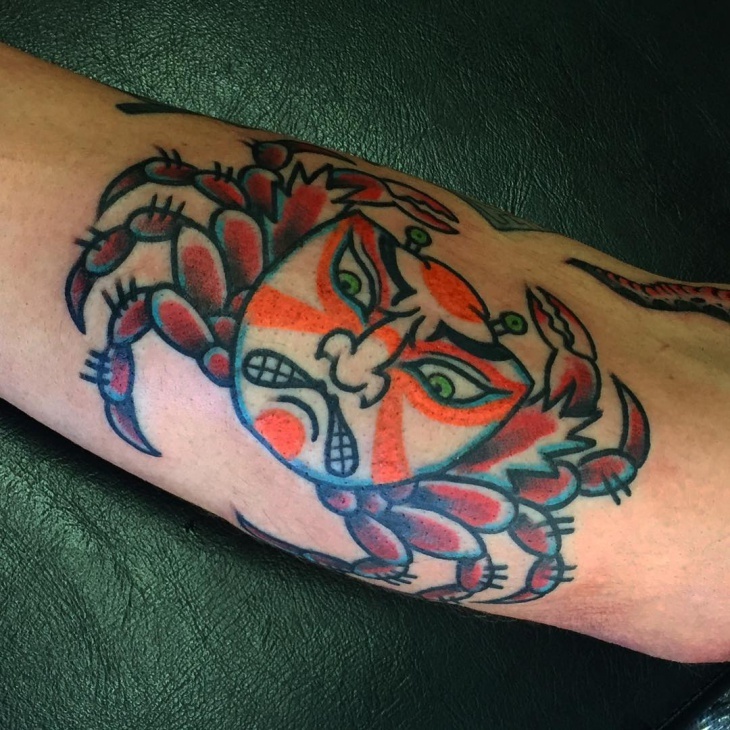 Most crabs would have a hard outer shell for protection of their delicate parts and with the Samurai Crab Tattoo idea design you can mainly resemble a strong defense at your side with ultimate protection. 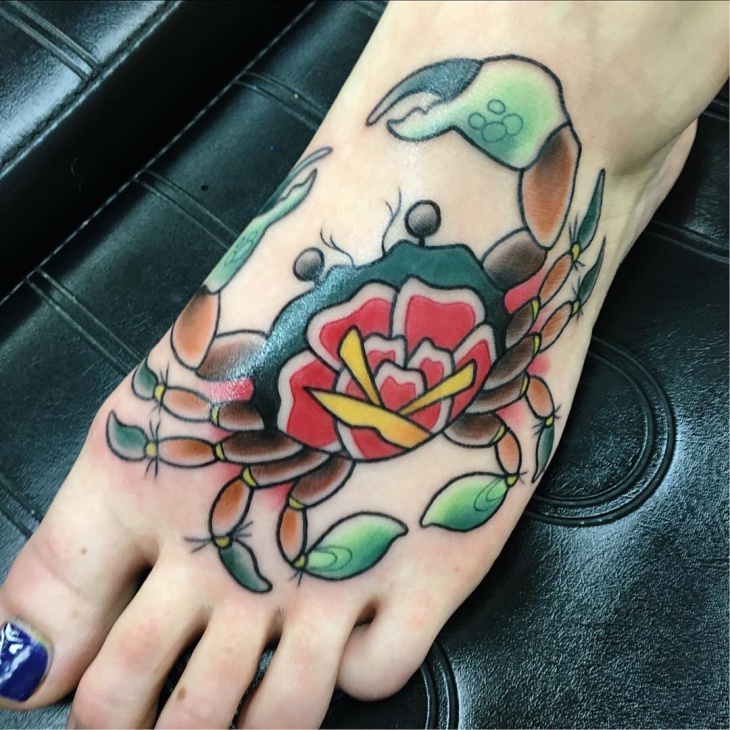 The deep meaning behind the tattoo and its color patterns make it a worth try on your tattoo list. 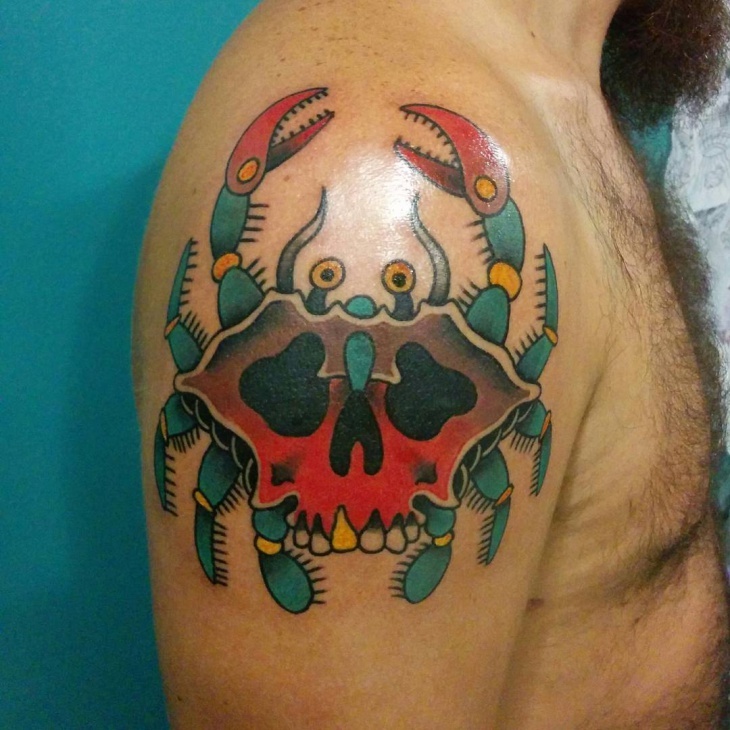 Be the favorite of zodiac believers with the colorful zodiac tattoo inked right on you. 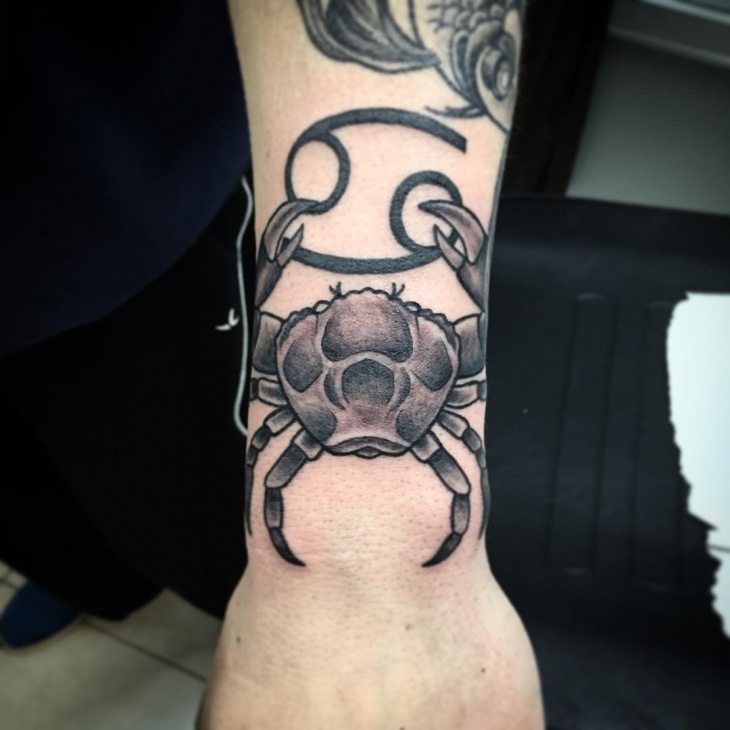 Additionally being the cancer zodiac sign the tattoo has many hidden meanings with the zodiac number right inked right at the middle. Amazing patterns and designs are an integral part of the tattoo. 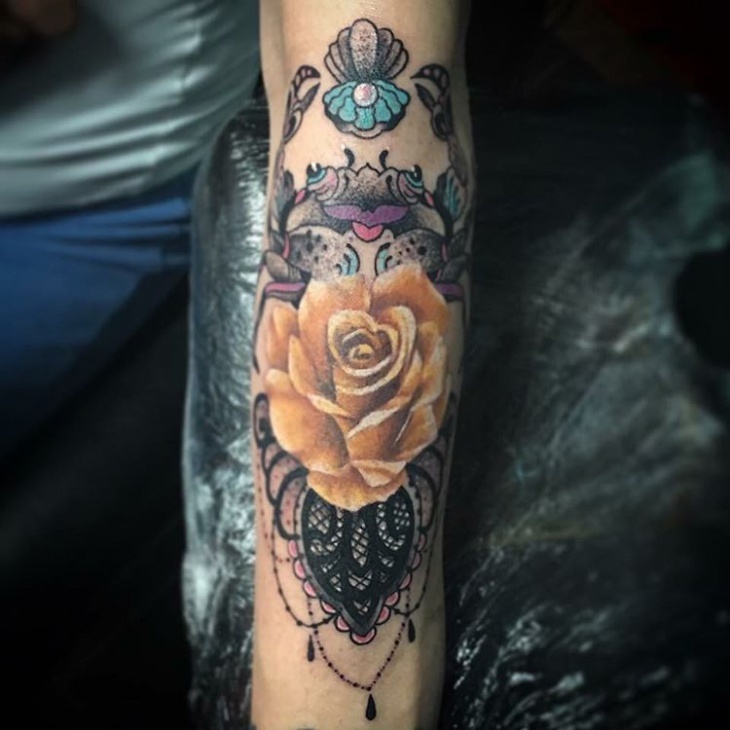 A tattoo for someone who wants to flaunt a range of colors and patterns with trendiness and flashiness! 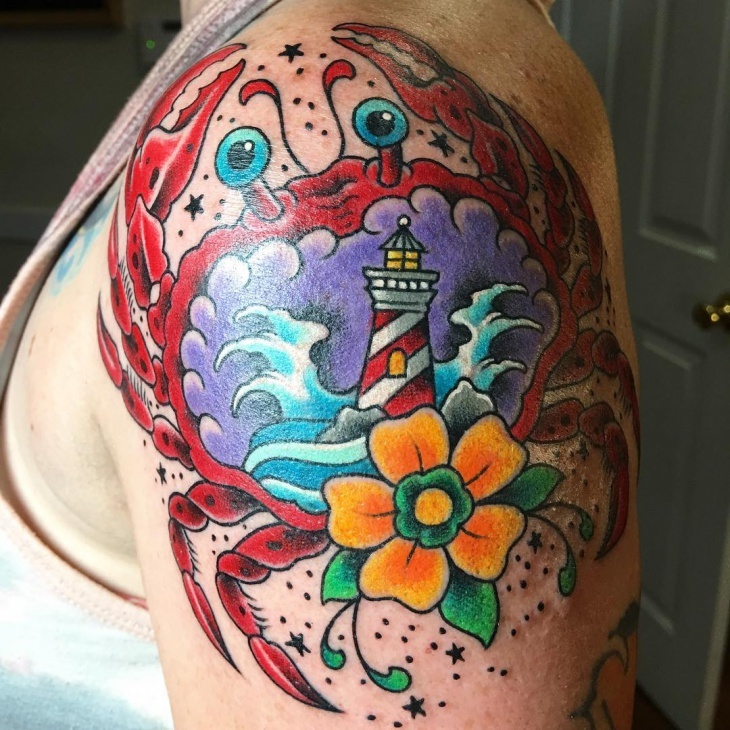 Funky Crab arm tattoo simply covers the idea of island life on your arm.